Habit: Perennial herb to shrub, decumbent to erect, < 2 m, aromatic. Leaf: petioled; blade generally ovate-deltate, base rounded to tapered, margin entire to shallowly crenate-dentate, lower surface generally gland-dotted. Inflorescence: flowers 1--several in leaf axils. Flower: calyx 5-lobed, 2-lipped; corolla 5-lobed, white to lavender or salmon, 2-lipped, lower lip spreading, upper erect, 2-lobed; stamens 4, in 2 pairs, anther sacs spreading; style 2-lobed, exserted. Fruit: 1--2 mm; surface smooth to net-like. Species In Genus: 150 species: generally Mediterranean, to Japan, Australia, also North America, South America. Etymology: (Latin: savory) Note: Clinopodium hortensis Kuntze cultivated as herb (summer savory). Habit: Perennial herb to subshrub, erect, < 2 m. Stem: non-woody except occasionally at base; hairs long, +- spreading. Leaf: 35--80 mm, 15--55 mm wide, +- ovate to triangular, shallowly, irregularly crenate-dentate; hairs appressed, white. Inflorescence: flowers 1--6 per leaf axil; pedicel 2--3 cm. Flower: calyx 14--17 mm, tubular-bell-shaped, veins purple, lobes 3--5 mm; corolla 15--35 mm, salmon-orange, generally faded when dry. Fruit: +- 2 mm, brown, surface smooth. Synonyms: Satureja mimuloides (Benth.) Briq. 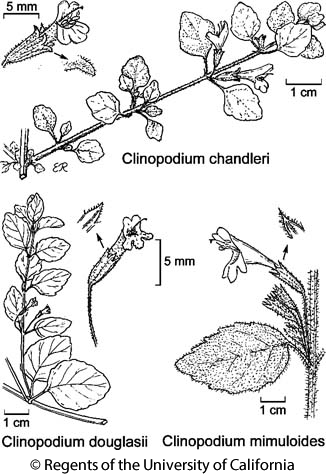 Citation for this treatment: Margriet Wetherwax & John M. Miller 2012, Clinopodium mimuloides, in Jepson Flora Project (eds.) Jepson eFlora, http://ucjeps.berkeley.edu/eflora/eflora_display.php?tid=80484, accessed on April 26, 2019. CCo, SCoRO, WTR, SnGb. Markers link to CCH specimen records. Yellow markers indicate records that may provide evidence for eFlora range revision or may have georeferencing or identification issues. Purple markers indicate specimens collected from a garden, greenhouse, or other non-wild location.